This recipe is very quick and easy, great for nights like tonight where i forgot to get any meat out of the freezer early enough .. I have change the recipe a bit to suit us ... I will type up the recipe as in the book and let you know what I change ..
1. Fry the bacon in a frying pan, then add mushrooms. Drain on absorbent paper and set aside. 2. In a mixing bowl, combine the eggs, cream, cheese and spring onion. Add the bacon and mushroom mix and stir through. 3. Cook the spaghetti in a large pot of boiling water until al dente. Drain and return to the saucepan. 4. Pour the sauce mixture over the spaghetti and stir through over low heat until the sauce mixture is just warmed through. Avoid heating too long as the egg will start to resemble scrambled egg. Loving the favicon! I really love that idea about having recipes you can dress up for 'company' - we have all thought it I am sure. 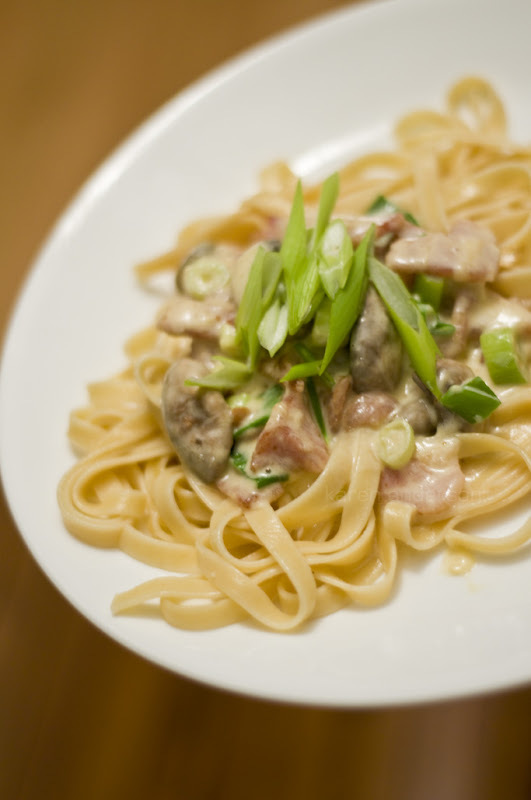 I wouldn't have thought to use spring onions in carbonara too. Looks delish! damn....now i am hungry again....and it's 10.45pm!